Here are a few things to avoid to keep that glow going! 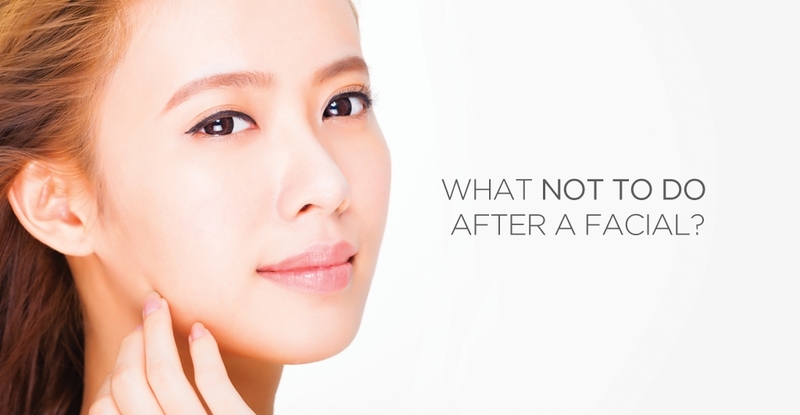 Don’t wash your face immediately after a facial. Your skin is still absorbing all of the goodness – washing it may just strip it all away. Touching your skin also transfers dirt and bacteria from your hands to your thoroughly cleansed face, this may even cause breakouts. A professional has just spent 60 minutes cleaning your skin, you can even skip the washing in the shower 😉 To be sure, you can check with your esthetician for more post care instructions. After all the scrubbing during a facial, you have a new batch of vulnerable skin cells on the surface that can easily burn. These skin cells are more sensitive to the sun’s harsh rays. If you have to be in the sun, use a high SPF sunscreen! Your freshly exfoliated skin will be slightly more sensitive than usual, wait at least 2 days after your facial before using any type of peel or retin a to prevent irritation and redness – especially if your facial treatment included deep exfoliation. If we leave a pimple behind, it is because it’s not close to the surface or ‘ripe’ yet. Leave it there for a few days, a deep cleansing facial may even help it naturally surface. Picking is never good, especially immediately after a facial as it may damage healthy skin cells and cause scarring. This includes going for a sauna! Also, your facial may already include steaming. Under an experienced esthetician’s care, steaming sessions should last long enough to open pores, but not too much or it can result in broken capillaries or skin sensitivity. Avoid vigorous exercises that could cause excessive sweating for the next 24 hours. The oil produced could clog your pores which have been thoroughly cleared out. You wouldn’t want to sweat out all the goodies your esthetician has just put in either!